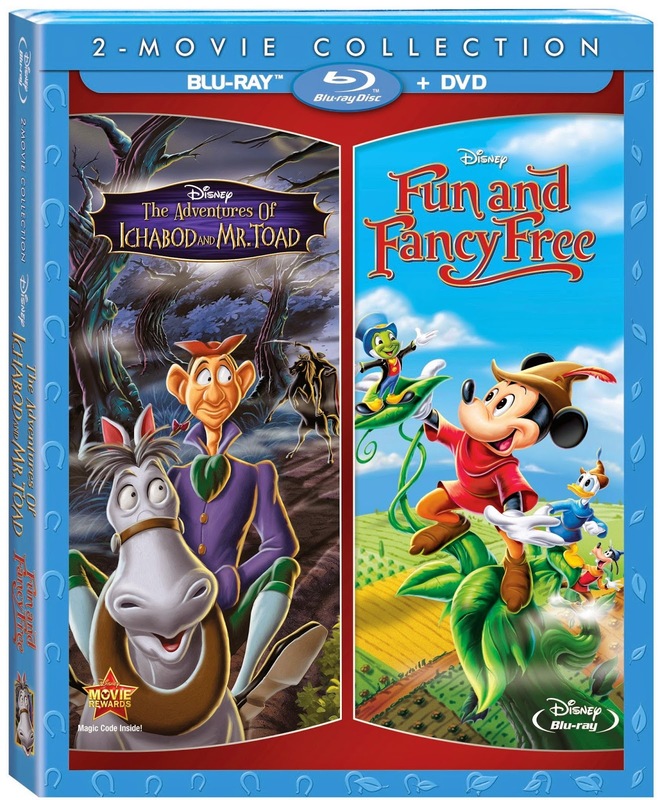 Always a classic in most any home now a days, Disney just released five classics to Blu-ray™, DVD and Digital Copy on August 12th, 2014. For the first time ever you can enjoy the same classics you did as a child with your children now! Each available separately, these titles have all been digitally re-mastered with high definition picture and sound. So not only do you get to watch these films again but in better quality! I was sent over Bedknobs and Broomsticks, Mickey, Donald and Goofy: The Three Musketeers, and Adventures Of Ichabod And Mr. Toad. 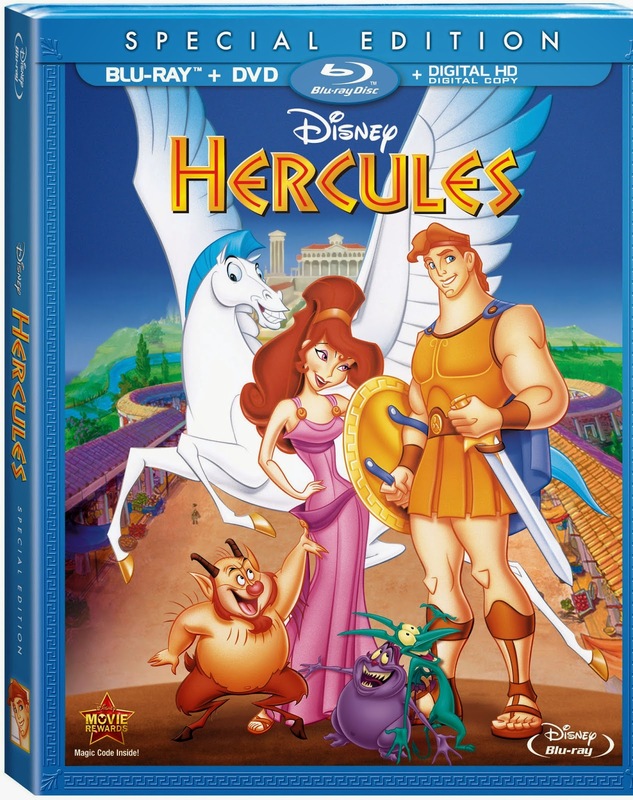 Also available at the same time is Tarzan and Hercules! The Bedknobs and Broomsticks synopsis says "Disney legends Angela Lansbury (“Beauty And The Beast”) and David Tomlinson (“Mary Poppins”) star in this beloved film about an apprentice witch who reluctantly takes in three orphan children. Though her first spells create more laughs than magic, Miss Price and the children soon find themselves swept away aboard a fantastic flying bed – their ticket to fun-filled excitement and adventure. Take the ride of your life with “Bedknobs And Broomsticks." 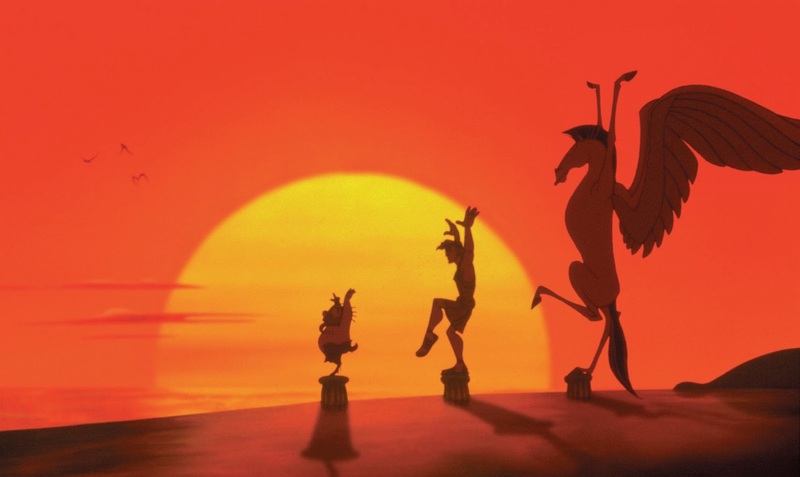 We've been dying to actually see this one as it is always a question on our Disney Scene It Trivia and none of us adults have even seen the movie! 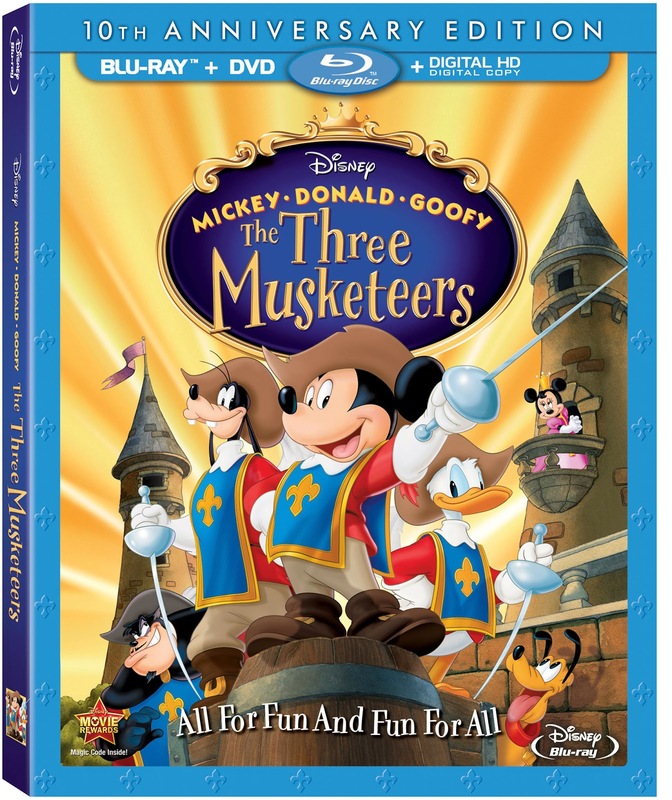 The Mickey, Donald and Goofy: The Three Musketeers synopsis says "Celebrate the 10th anniversary of Disney’s swashbuckling adventure, “Mickey, Donald and Goofy: The Three Musketeers,” presented for the first time ever in a dazzling new Blu-ray Special Edition! Join Mickey and all your favorite Disney characters in this outrageously funny take on the timeless tale. Best buddies Mickey, Donald and Goofy are small-time janitors with big dreams of becoming Musketeers. They may not look like heroes, but, powered by teamwork and friendship, they soon discover they can accomplish anything if they work together. Packed with six rousing songs and now fully-restored with new and classic bonus features, this heartwarming family film is better than ever on Disney Blu-ray and High-Def Digital. It’s “All For Fun And Fun For All!”"
We were also pretty pumped to watch this one as it is yet another of the Disney films we hadn't seen. This one was just perfect for Dane and Declan for more reasons than one! Not only did they enjoy one of their favorite cartoon characters, Mickey Mouse, but they loved the story line and action of the Musketeers! 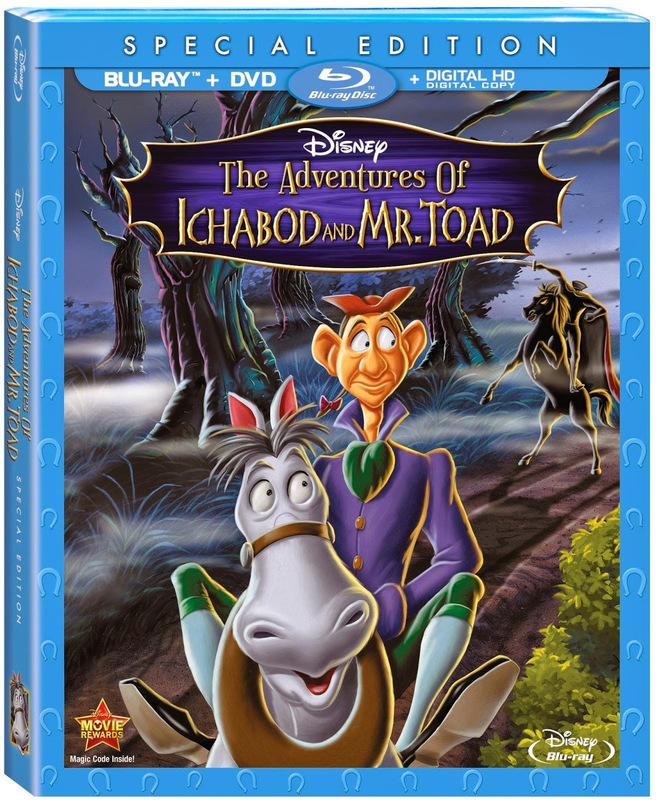 The Adventures Of Ichabod And Mr. Toad synopsis says, "First, hang on for a wild ride with the fun loving Mr. J. Thaddeus Toad. When his passion for motorcars lands him in hot water, he must rely on his faithful friends to clear his name. Then meet the infamous Ichabod Crane whose comic rivalry for the affections of the town beauty leads to a heart-pounding race with the legendary Headless Horseman. 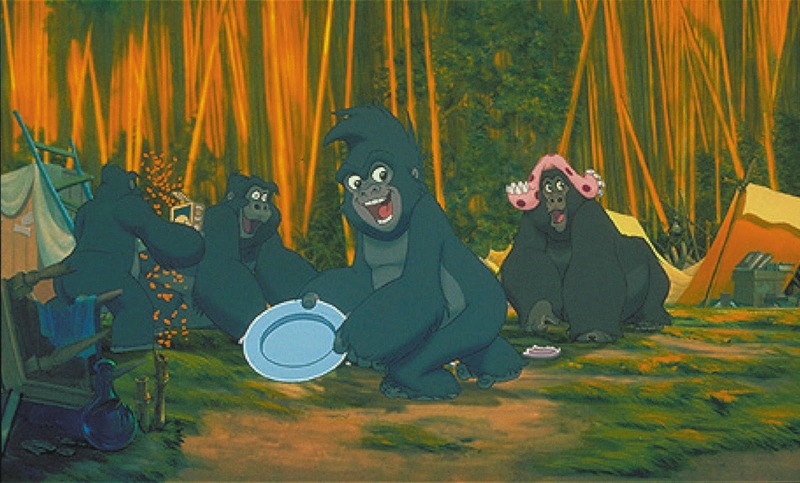 Share these high-spirited adventures with your whole family on Blu-ray and Digital HD." 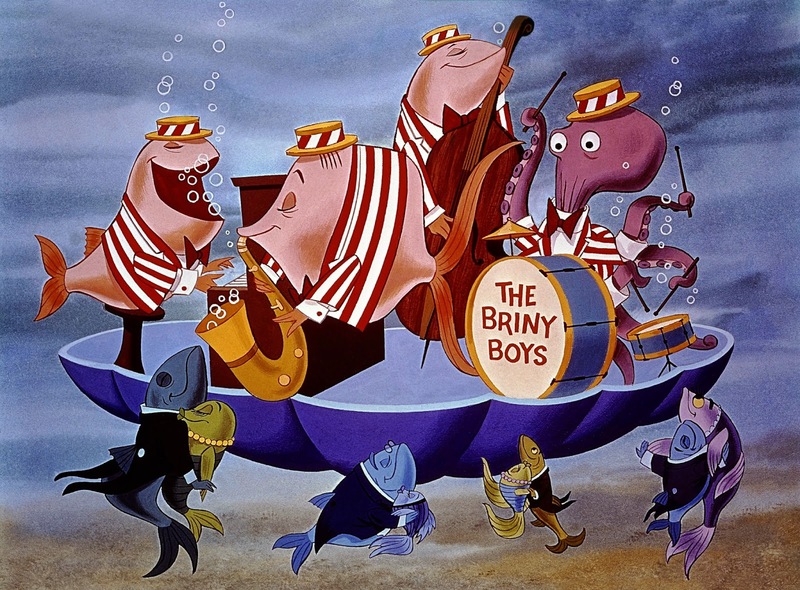 Recommendation: Both boys enjoyed watching all but the Bedknobs and Broomsticks one which bored them a bit but us adults enjoyed watching it. Kevin even discovered he had actually seen it beforehand. Regardless I think these classics are worth having around in any household.